A division of Unique Maritime Group (UMG) which is one of the world’s leading integrated turnkey subsea and offshore solution providers, Unique Wellube was recently contracted by Abu Dhabi Marine Operating Company (ADMA-OPCO) for the supply and engineering of mechanical seal plugs for a significant pipeline isolation project. ADMA-OPCO is a major producer of oil and gas from the offshore areas of the Emirate of Abu Dhabi. The Company prides itself in being a pioneering petroleum organisation in the Middle East, having completed over 52 years of oil and gas production. ADMA-OPCO’s 8” subsea riser was found to have some damages which would require a weld repair at the splash zone on the complex side. The plan was to cut approximately 1.5 meters of the riser till below the damaged area and weld a new spool in place. Since welding was involved, either the pipeline had to be free of hydrocarbon fumes or a positive isolation had to be created to prevent the fumes from reaching the welding area. However, there was no break flange available in the repair location to isolate the pipeline to conduct the repair works. ADMA’s initial plan was to pig the riser to make the riser free from hydrocarbon fumes. However, the estimated cost to execute pigging was comparatively high and the time required to ensure that the riser was free of hydrocarbon fumes would be very long, making the riser non-functional for the duration. Based on ADMA-OPCO’s experience from past projects in providing innovative solutions, ADMA approached Unique Wellube to once again look for a cost effective and quick turnaround solution to the present 8” riser weld problem. Using Wellube’s extensive experience in line stops and plugging, Wellube’s engineers along with ADMA’s technical team, decided to look at feasibility of using an Extended Retractable Mechanical Seal Plug. The Plug would have to be installed at a distance of 2 meters from the top of the riser. A joint risk assessment was conducted and it was decided to go ahead with a workshop trial to study the performance of the extended plug. Based on the outputs of the meeting and the risk assessments, Unique Wellube designed and manufactured an 8” Extended Plug. The plug was inserted into a mock-up pipe piece, at a depth of 2 meter distance from the top of the pipe and tightened manually from the top. To ensure the integrity of the plug, fire foam was injected into the mock-up pipe for half a meter from the top of the Seal Plug creating a head pressure and kept under observation for 3 hours. Subsequently, inspection was carried out on the other side of the Plug and it was found to be 100% leak proof. 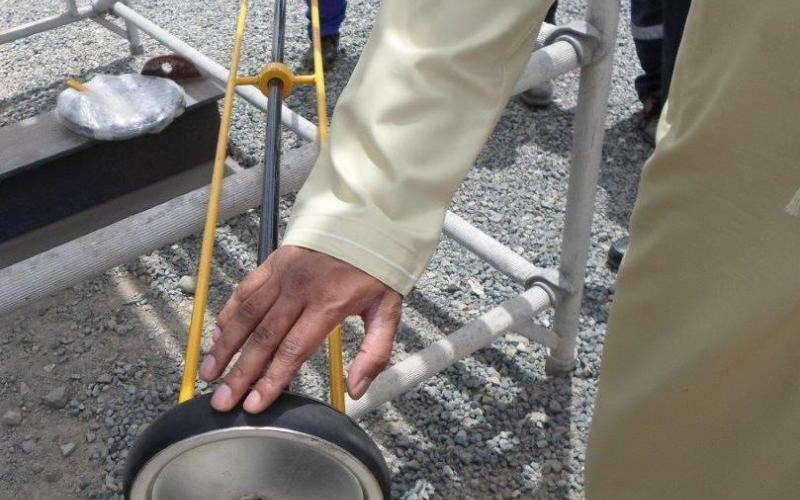 The plug was first tested successfully in-house at Unique Wellube’s Hamriyah Free Zone facility and thereafter, another demo was carried out in Abu Dhabi, which was witnessed by ADMA-OPCO’s team, including the HSE, Technical Support, Integrity, Inspection & Engineering departments. Following the successful trials, the tool was approved for use by ADMA-OPCO and a new set of the Extended Plug was manufactured and deployed to the offshore facility to be used under live condition. In mid-August 2014, ADMA-OPCO completed the work at Umm Shaif Super Complex using the Extended Retractable Mechanical Seal plug and the project was considered a total success.